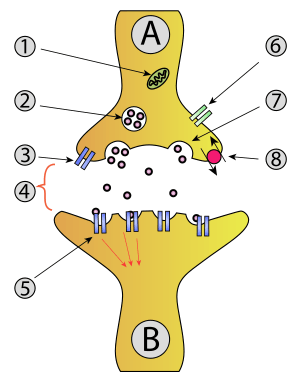 Activity at an axon terminal: Neuron A is transmitting a signal at the axon terminal to neuron B (receiving). Features: 1. Mitochondrion. 2. Synaptic vesicle with neurotransmitters. 3. Autoreceptor. 4. Synapse with neurotransmitter released (serotonin). 5.Postsynaptic receptors activated by neurotransmitter (induction of a postsynaptic potential). 6. Calcium channel. 7. Exocytosis of a vesicle. 8. Recaptured neurotransmitter. 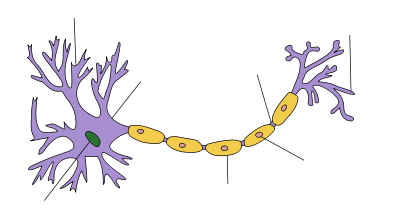 Axon terminals (also called synaptic boutons) are distal terminations of the branches of an axon. An axon nerve fiber is a long, slender projection of a nerve cell, or neuron, that conducts electrical impulses (called "action potentials") away from the neuron's cell body, or soma, in order to transmit those impulses to other neurons. Neurons are interconnected in complex arrangements, and use electrochemical signals and neurotransmitter chemicals to transmit impulses from one neuron to the next; axon terminals are separated from neighboring neurons by a small gap called a synapse, across which impulses are sent. The axon terminal, and the neuron from which it comes, is sometimes referred to as the "presynaptic" neuron. Neurotransmitters are packaged into synaptic vesicles that cluster beneath the axon terminal membrane on the presynaptic side of a synapse. The axonal terminals are specialized to release the electrical impulse of the presynaptic cell. The terminals release transmitter substances into a gap called the synaptic cleft between the terminals and the dendrites of the next neuron. The information is received by the dendrite receptors of the postsynaptic cell that are connected to it. Neurons don't touch each other, but communicate across the synapse. The neurotransmitter molecule packages (vesicles) are created within the neuron, then travel down the axon to the distal axon terminal where they sit docked. Calcium ions then trigger a biochemical cascade which results in vesicles fusing with the presynaptic membrane and releasing their contents to the synaptic cleft within 180 µs of calcium entry. Triggered by the binding of the calcium ions, the synaptic vesicle proteins begin to move apart, resulting in the creation of a fusion pore. The presence of the pore allows for the release of neurotransmitter into the synaptic cleft. The process occurring at the axon terminal is exocytosis, which a cell uses to exude secretory vesicles out of the cell membrane. These membrane-bound vesicles contain soluble proteins to be secreted to the extracellular environment, as well as membrane proteins and lipids that are sent to become components of the cell membrane. Exocytosis in neuronal chemical synapses is Ca2+ triggered and serves interneuronal signalling. Dr. Wade Regehr, a Professor of Neurobiology at Harvard Medical School's Department of Neurobiology, developed a method to physiologically see the synaptic activity that occurs in the brain. A dye alters the fluorescence properties when attached to calcium. Using fluorescence-microscopy techniques calcium levels are detected, and therefore the influx of calcium in the presynaptic neuron. Regehr's laboratory specializes in pre-synaptic calcium dynamics which occurs at the axon terminals. Regehr studies the implication of calcium Ca2+ as it affects synaptic strength. By studying the physiological process and mechanisms, a further understanding is made of neurological disorders such as epilepsy, schizophrenia and major depressive disorder, as well as memory and learning. ↑ "Axon Terminal". Medical Dictionary Online. Retrieved February 6, 2013. ↑ Foster, Sally. "Axon Terminal - Synaptic Vesicle - Neurotransmitter". Retrieved February 6, 2013. ↑ Llinás R, Steinberg IZ, Walton K (1981). "Relationship between presynaptic calcium current and postsynaptic potential in squid giant synapse". Biophysical Journal. 33 (3): 323–51. doi:10.1016/S0006-3495(81)84899-0. PMC 1327434 . PMID 6261850. ↑ Chudler, Eric H. (November 24, 2011). "Neuroscience for kids Neurotransmitters and Neuroactive Peptides". Archived from the original on December 18, 2008. Retrieved February 6, 2013. ↑ Sauber, Colleen. "Focus October 20-Neurobiology VISUALIZING THE SYNAPTIC CONNECTION". Archived from the original on 2006-09-01. Retrieved July 3, 2013. ↑ Regehr, Wade (1999–2008). "Wade Regehr, Ph.D.". Retrieved July 3, 2013. ↑ President and Fellows of Harvard College (2008). "The Neurobiology Department at Harvard Medical School". Archived from the original on 20 December 2008. Retrieved July 3, 2013. ↑ "NINDS Announces New Javits Neuroscience Investigator Awardees" (Press release). National Institute of Neurological Disorders and Stroke. May 4, 2005. Archived from the original on January 17, 2009. Retrieved February 6, 2013. ↑ "Scholar Awards". The McKnight Endowment Fund for Neuroscience. Archived from the original on 2004-05-08. Retrieved July 3, 2013. Cragg, Stephanie J.; Greenfield, Susan A. (1997). "Differential Autoreceptor Control of Somatodendritic and Axon Terminal Dopamine Release in Substantia Nigra, Ventral Tegmental Area, and Striatum". The Journal of Neuroscience. 17 (15): 5738–46. PMID 9221772. Vaquero, Cecilia F; de la Villa, Pedro (1999). "Localisation of the GABAC receptors at the axon terminal of the rod bipolar cells of the mouse retina". Neuroscience Research. 35 (1): 1–7. doi:10.1016/S0168-0102(99)00050-4. PMID 10555158. Roffler-Tarlov, Suzanne; Beart, P.M.; O'Gorman, Stephen; Sidman, Richard L. (1979). "Neurochemical and morphological consequences of axon terminal degeneration in cerebellar deep nuclei of mice with inherited purkinje cell degeneration". Brain Research. 168 (1): 75–95. doi:10.1016/0006-8993(79)90129-X. PMID 455087. Yagi T, Kaneko A (1988). "The axon terminal of goldfish retinal horizontal cells: A low membrane conductance measured in solitary preparations and its implication to the signal conduction from the soma". Journal of Neurophysiology. 59 (2): 482–94. PMID 3351572.